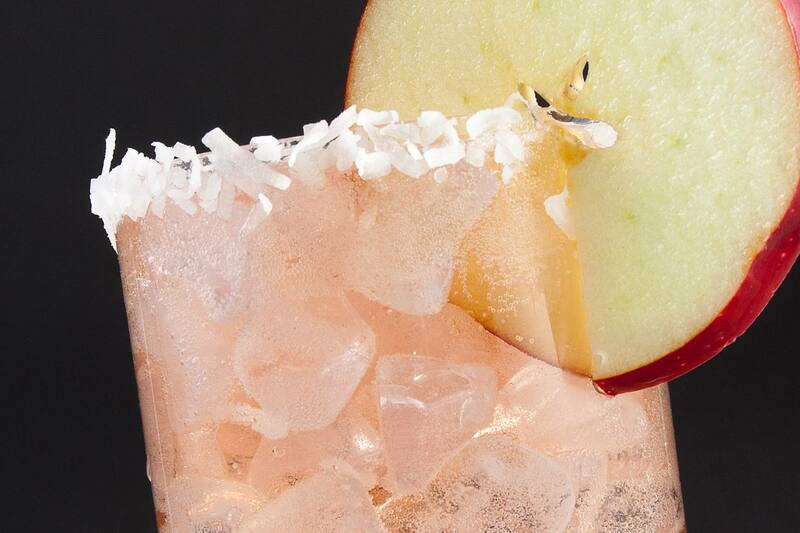 Apples have long been a favorite cocktail flavor. Whether it is hot apple cider, chilled apple juice, or one of the tasty apple brandies, the flavor of the apple makes a great foundation for many mixed drinks. This recipe collection explores all of those options and includes many of our favorite apple cocktails as well as some obscure, unknown, and interesting recipes. You will find that apple mixes well with a variety of flavors from the obvious cinnamon and caramel to the not-so-obvious mango and rosemary. Apple juice gives a drink a nice, pure apple flavor. Many of these apple juice cocktails are simple and easy to mix up at a moments notice. While we typically associate apples with autumn, the majority of these drinks are perfect for year-round enjoyment. When buying apple juice, look for a bottle with the fewest additives for the truest flavor or, better yet, go with an organic apple juice as these typically have no extra ingredients. Clear apple juice is probably the most familiar to many drinkers. It is that lovely caramel-colored juice that can be found in any market. Most of the time it has been filtered twice and it is during the second filtration when the last pieces of pulp are removed. Cloudy apple juice is considerably less transparent than clear apple juice and it is easy to recognize in the store. It is filtered once and retains some of that pulp that is removed in the more refined juice. Cloudy apple juice is generally noted to be healthier because it has more antioxidants and it is becoming easier to find. The majority of the time clear apple juice will be preferred for mixed drinks. Its transparent appearance is simply more visually appealing and creates a cleaner look in the finished drink. Some drinks like the Bramble Bar Cocktail and Great Gazoo specifically call for cloudy apple juice. Apple cider is, essentially, an unfiltered apple juice that tends to have a stronger flavor, which is why we can't get enough of apple cider cocktails. It is a popular ingredient in mixed drinks, particularly for warm cocktails that are delicious on cold days. Apple Cider - The most common cider available. Some ciders are a blend of different apple varieties and others include a blend of spices to add extra flavor. Unfiltered Apple Cider - Produced very quickly by pressing fresh apples through cheesecloth. This style of cider is easy to do at home and is called for specifically in a few cocktails, most notably the Chimayo. Hard Cider - An apple cider that has been fermented to create a slightly alcoholic drink, often right around 6% ABV. Sparkling Cider - A non-alcoholic apple cider that has carbonation added. It makes a great substitute for sparkling wine when making mocktails. The word cider alone means different things to different people. In the U.S. cider is often used to mean apple cider. In other countries, cider can often be used to describe the fermented beverages that Americans call hard cider. Here is a list of apple cider drink recipes. To make the list easier to navigate, we have also noted the type of cider and other primary ingredients needed. Apple flavored distilled spirits are nothing new. Apple brandy and apple whiskey are two of the oldest liquors that took on the fruity flavor. Though they are used in a few modern drinks, both apple brandy and whiskey are primarily found in classic cocktail recipes when the spirits were far more common than they are today. Good apple brandy such as Santa Fe Spirits Apple Brandy is actually distilled from apples (instead of grapes). Some low-quality apple brandies simply add flavoring ingredients to regular brandy and are overly sweetened. Apple whiskey is another ingredient commonly found more often in classic cocktails than modern ones. There are a few good apple whiskeys available, though caution should be taken because many are too sweet to work in these old-fashioned drinks. Jack Daniel's Winter Jack is a seasonal release that is technically an apple cider liqueur with a whiskey base. Today, we also have apple vodka, gin and rum to play with and a few of these cocktails use those. Apples are also perfect for homemade infusions (ie. Apple-Pear Gin) so you can use the fruit to experiment with your own apple-flavored spirits. Another modern convenience is the myriad of often sour apple liqueurs and schnapps. While they are not typically the highest quality spirits available, they are just that, convenient and can be used to create some fun cocktails. Berentzen and Bols are two brands that produce a good apple liqueur. Using a slice of apple to garnish an apple cocktail is a great idea, but it comes with one fundamental issue: cut apples turn brown quickly. This is a natural reaction of the fruit when the white flesh is exposed to oxygen. There are other fruits and vegetables that have the same reaction though apples are the most noticeable and one that we use often as a cocktail garnish. There's definitely a trick to a fresh apple garnish. Rather than skip the apple garnish, there is a very quick fix that will stop an apple slice from turning that nasty brown. Before cutting an apple for a garnish, pour a small amount of lemon juice into a bowl. Remove any produce stickers and wash the apple. Cut a slice or wedge of apple and immediately dunk the apple into the bowl of lemon juice. Shake off any excess juice and garnish the drink.